Combining athletic good looks with agile handling and dynamic performance, the GLA is the compact SUV you’ve been waiting for. The re-worked exterior elements of the GLA contribute to its distinguished design, while the interior uses premium quality materials and finishes to impressive effect. A choice of model lines includes the striking GLA WhiteArt Edition, and there’s an array of optional technology available — from Garmin® MAP PILOT navigation to hands-free boot access for easy loading. Safety is outstanding, with a variety of driver assistance systems on offer to help you avoid danger when you’re out on the road. A line-up of powerful and efficient engines includes the GLA 250 4MATIC, which can accelerate from 0 to 62 mph in only 6.6 seconds. And the GLA 200 d, which can return up to 67.3 mpg* combined. The GLA SE with 17" alloy wheels in a 5-twin spoke design, beltline strips in chrome optic and twin-louvre grille makes a strong impression with new styling features inside and out. The interior of the SE features ARTICO leather¹ upholstery for the seats with extendable seat cushions. 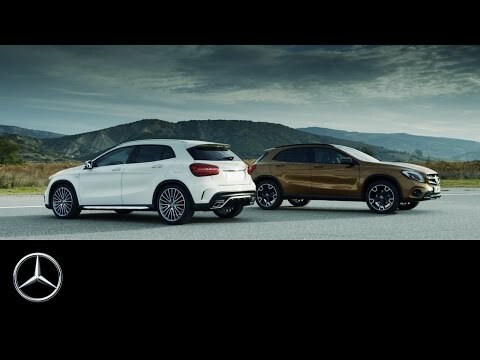 The Mercedes-Benz GLA Sport conquers the road with style, functionality and exhilarating technology – from the chrome-style front apron and the18" alloy wheels to the twin-pipe exhaust system with chrome detail. The Sport interior welcomes you with ARTICO leather¹ upholstery and a wave-design trim in silver or anthracite. The nappa leather-trimmed multifunction 12-button steering wheel puts all your driving information at your fingertips. Along the way you’re supported by clever technology: ATTENTION ASSIST alerts you if you lose concentration on long journeys, while the reversing camera helps you keep the GLA scratch-free. The rear armrest has two cup holders, and there are plenty of useful stowage areas throughout – including up to 481litres of luggage space in the boot. For your entertainment, the GLA Sport comes with Audio20 CD multimedia system featuring a 8-inch Media Display. The GLA AMG Line lends even greater sporty appeal to our striking new SUV. Equipped with all the functional and technological assets of the Sport, the GLA AMG Line also comes with AMG bodystyling, perforated front brake discs and brake calipers with ‘Mercedes-Benz’ lettering. The sports seats with integrated head restraints featuring black ARTICO leather¹/DINAMICA microfibre upholstery offer support on every terrain, and for a firm grip the brushed stainless steel sports pedals are fitted with rubber studs. The Mercedes-AMG GLA45 4MATIC delivers outstanding performance and efficiency. Equipped with the world’s most powerful 4-cylinder engine, the GLA45 4MATIC produces 381hp (280kW) from a capacity of just 2 litres. The high-performance powertrain generates 475Nm of torque and accelerates the car from 0–62mph in 4.4 seconds. A walk around the GLA45 4MATIC reveals striking characteristics: 19"AMG alloy wheels with red brake calipers, AMG bodystyling all round and AMG sports exhaust with chromed twin tailpipes. Inside, all the controls and displays reflect performance-driven design, like the AMG DRIVE UNIT with E-SELECT in the centre console and the AMG instrument cluster, for example. AMG Performance seats are upholstered in ARTICO leather¹/DINAMICA microfibre with red contrast stitching and red designo seat belts. With striking yellow accents set against cosmos black metallic paint, the new Mercedes-AMG GLA 45 4MATIC Yellow Night Edition grabs your attention and doesn’t let go. Distinctive design elements range from 20” AMG 10-spoke alloy wheels with yellow rims to the AMG rear aerofoil, finished in high gloss black with yellow highlights. Inside, there’s yellow trim on the air outlets and floor mats, and yellow stripes and top stitching on the black ARTICO leather¹ / DINAMICA microfibre upholstery. A wealth of technology includes the superb Harmon Kardon® Logic 7® surround sound system. To arrange your Test Drive and discover more call a member of our team today on 01494 412063 for our Beaconsfield branch or 01296 321732 for Aylesbury. Exterior highlights on the latest GLA include an all-new radiator grille featuring twin perforated louvres that lends the car a more muscular, forceful look. The revised front bumper shares the same dynamic off-road style, complemented by front fog lights on the SE and Sport. The GLA offers an array of technologies including Android Auto and Apple CarPlay™ for effortless smartphone integration. All models feature pre-installation for Garmin® MAP PILOT navigation, while the large screen media display gives you access to maps, music and much more. KEYLESS-GO is standard, so you’ll no longer need to turn a key to start the car, and the KEYLESS-GO Comfort package is optionally available. For convenient loading and unloading, it lets you open and close the boot hands-free by making a kicking movement under the rear bumper.